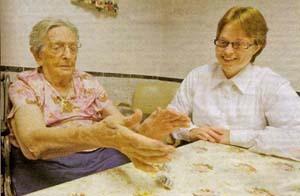 A jovial young woman plays bunko, a dice game, with an elderly lady. It could be a scene in any nursing home or senior center. 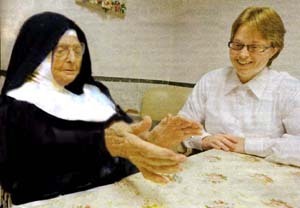 Reading the caption under the picture, however, one discovers that the senior citizen is Sister Mary Traut at the Rosary Hill Convalescent Home and the young woman is a Dominican postulant. The progressivist Catholic paper features the picture to express the supposed new enthusiasm for religious life (Oct. 15, 2010). This is not very honest, because today’s small surge in vocations is found primarily in the Orders where there are still traditional habits and ordered schedules in the convents. I am sure when the sister in this picture entered religious life, she wore a full habit and lived in community, as all religious women did before Vatican II. I wonder if she imagined she would end her life in a convalescent home, wearing lay clothing, her hair cropped and visible, distinguishable as a religious only by the medal worn around her neck. But even that medal does not identify her as a nun at first sight, since many lay women wear medals. Before Vatican II, the elderly sisters used to remain in their convents, tended by the younger sisters and postulants, who also wore habits. When relatives and friends came to visit, they would feel a religious aura that emanated from the convent walls and all who were in it. They would not expect to play a game of bunko with an elderly sister; they would come to receive her counsel and encouragement to stay firm the course in this earthly life. They did not know that this sister had a bad temper or that one was not always punctual. They saw sisters who had freely renounced the world and their families to follow the counsel of Christ. For the love of Christ, they had consecrated all their powers to the office of the care of souls, Christian education and prayer for the conversion of sinners. Their total dedication was represented by the habit, the sign of the sister’s voluntary denial of the world with all its fashions, follies and entertainments. The spirit of religion was present in this symbol, one of so many, so that the convent and its inhabitants exercised an unspoken influence on all who came into contact with them. Who could guess that the elderly woman in this picture had turned her back on the world and dedicated her life to religion? It seems the opposite, since everything about the way she looks is very secular. She wears a short-sleeved print blouse, perhaps to be cooler or more comfortable, and seems engrossed in the dice game. Her young friend is cheerful in carrying out the act of charity, but she understandably does not display the reverence one might expect a postulant to show before an elderly sister. I have a pity for the elderly sister who has become so much a part of the world that she has lost the aura of religious dignity that used to be an integral note of a sister, and especially an elderly one. What a difference the religious habit makes.